In the art and science of dentistry, listening, as well as experience, are essential in providing the kind of treatment a patient desires. 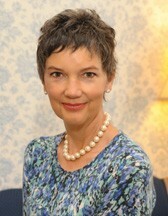 Our patient, Christine, had two porcelain veneers placed on her front teeth several years earlier by another dentist. She was not happy with their appearance; she felt they “stuck out too much, were too big, and too dark compared to her other teeth”. 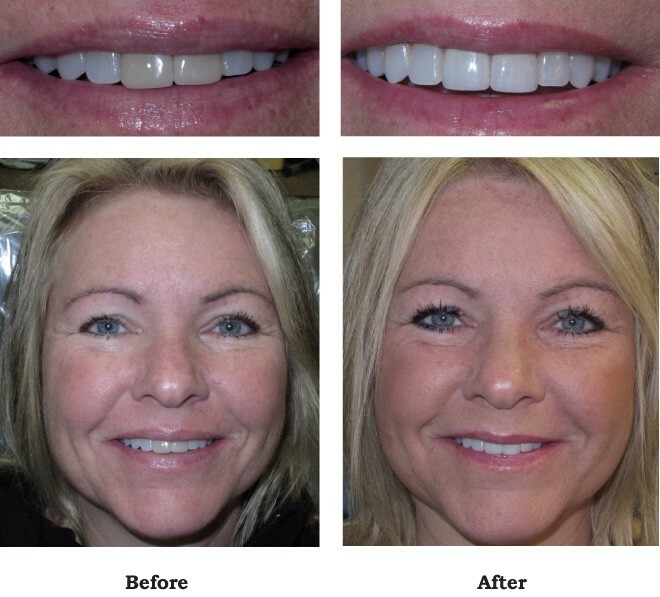 She was not given a chance to adequately view the veneers nor express her opinion prior to cementation and had been unhappy since they were placed. Christine read about us in the Women’s Journal. She saw some examples of our other successful cosmetic cases and came in for a complimentary second-opinion consultation. It was obvious that the front two teeth were too yellow and her right front tooth was too long. From my prior experience, I was able to determine that the front surfaces of the teeth were too rounded, the veneers were too bulky at the gum line and the shaping needed to be toned down. Not only were the veneers unaesthetic, but they were causing gum problems. When there is a bulky projection in the gum pocket, at the gum margin, there will be swelling and inflammation of the gum tissue. Her gum bled very easily when checking with a periodontal probe. Fortunately, my dental laboratory is located only a few buildings away from mine. Christopher, of Elite Dental Lab, is happy to walk up to our office, during the patient’s appointment, and help us determine the shade for our cosmetic cases. He also listens closely to my descriptions for the shapes, sizes and positions of the restorations. Often I will provide him with a model of the teeth exactly how I want them to appear and he follows my direction meticulously. If our patient has a good “eye” for color and shape, as do I and my assistants, then (s)he will be asked to give his or her opinion during the planning stage. It is rare that a case will come back perfectly; there are usually some minor tweaks and adjustments to be made on the date of delivery. We always ask our patient to thoroughly critique the restoration, look at it in fluorescent and natural light, observe the appearance in a large and a small mirror, bring a trusted friend or relative to give their honest opinion. Once we have the patient’s approval, the new crowns or veneers are bonded. The before and after photos show that subtle changes can make all the difference between an average result with bleeding swollen gums and a beautiful, cosmetic, natural smile with firm and healthy tissue.